A friend recently bestowed upon me my very first A England polish. Initially, I thought, yeah, that's pretty. It's a blue holo...cool. But then I put it on my nails and the polish pretty much flicked me on the nose and was like, "LOOK HOW AMAZING I AM!" So I listened and now it's one of my favorite polishes ever. Dancing with Nureyev is from A England's Ballerina Collection. It is a steely blue linear holo with a slight violet shift. I had difficulty capturing the color shift, but did my best. One particularly notable thing about this polish is that it is beautiful in one coat! The following photos are with 2 coats. I added an accent nail with Zoya Caitlin. I think the two look stunning together! Look how beautiful the holo effect is! This is the best I could do to capture the violet color shift. It's so much prettier in person. 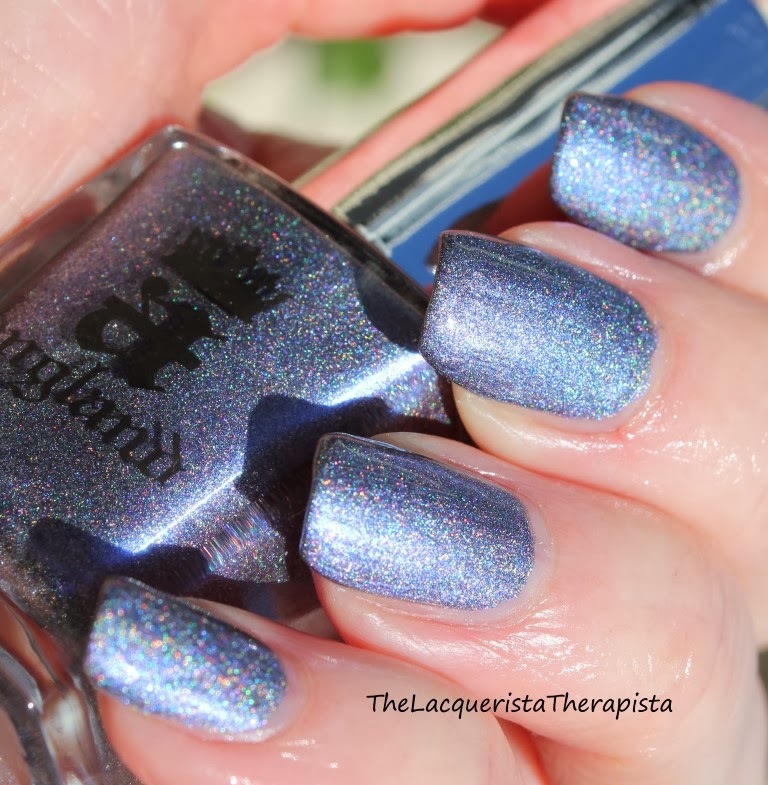 I don't have anything like this polish and I look forward to trying other A England polishes! A England is a UK based brand, but is available around the world. It is available in the US at Llarowe or NinjaPolish. Zoya is available at zoya.com. All polishes mentioned in this post are from my collection and were not provided for review. All opinions are my own. I have to try some of those A-England Polishes! Love your blog! Thank you for reading! I hope to get some new posts up soon. A-England polishes are so wonderful!